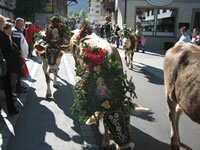 For the people of the Zillertal it's a living tradition – for visitors a very special colourful spectacle: everything is afoot as, marking the end of the time in the mountain pastures and the beginning of the winter stabling, the cows, festively "wreathed" with flowers, garlands and panels with sayings and religious texts, as well as large bells, are driven down from the Zillertal's alpine pastures. 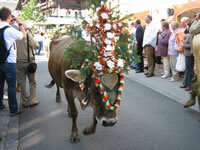 The "Almabtrieb" is a particularly colourful spectacular: the animals return "home" to Mayrhofen from the Zillergrund, the Stilluptal, from Ginzling and the Tuxertal. 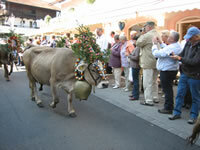 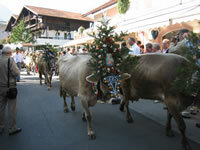 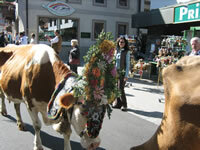 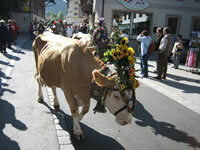 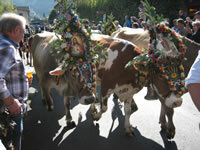 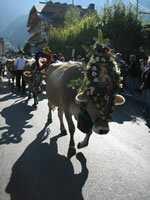 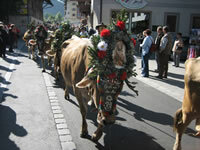 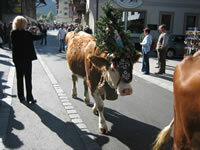 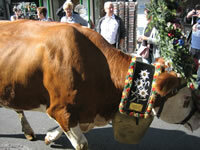 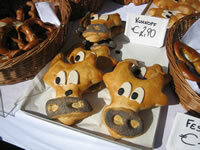 In each case the "Moarkuh" (lead cow) heads the brightly decorated procession. 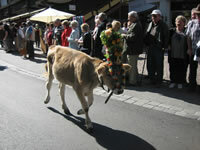 Cows, calves, steer, young bulls and small beasts, like sheep and goats, follow in turn. 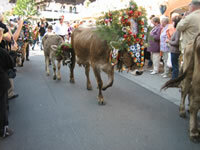 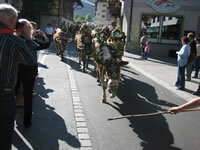 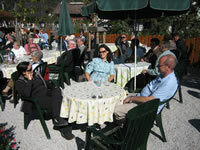 Thousands of people from Austria and aboard do not allow these rural festivities to pass by unnoticed – alone because of the delicacies offered at the large “Almabtriebsfest” in Mayrhofen: A farmers' market, a demonstration of schnapps distilling and numerous stalls offering Zillertal specialities like doughnuts, "Melchermuas", "Zerggl", farmhouse bread, bacon, grill specialities, pine schnapps and sweets. 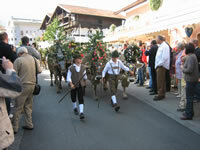 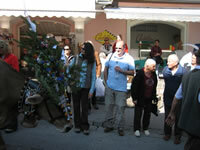 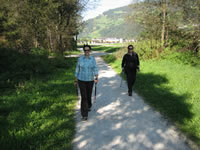 Folk dancers, whip handlers and other folk groups will be welcoming the "home-comers" along the main street .